A great buy for those who want oodles of power in a small and compact chassis. The camera is rather disappointing though and the design is a bit uninspired. The Lenovo Z2 Plus is the successor to the Zuk Z1 released a few months ago. It aims to offer top of the line specifications at an affordable cost. What makes the Z2 Plus stand out from the competition is the fact that all this power is packed in a chassis which is rather compact and is perfect for one handed use. From the display size to the software, Lenovo has made a lot of decisions with the sole focus of enhancing one handed usability. How does the Z2 Plus compare against tough competition from the likes of the ZenFone 3, Xiaomi Mi 5 and the LeEco LeMax 2? Let’s find out! This is where things get really interesting. The Lenovo Z2 Plus has a reinforced rollcage design and body is made of fibre glass, which Lenovo claims is lighter and stronger than metal. The company also says the fibre glass body helps enhance cellular quality and provides for very efficient thermal management. The problem is that inspite of all the gimmicks, the smartphone just doesn't look premium. The design comes across as very safe, boring and uninspiring. That’s not to say it doesn't look good, it looks classy and suave, albeit in a very unassuming way. Lenovo could have definitely added some flair to the Z2’s design. Another source of frustration is the all glass front and back because of which the device is an absolute fingerprint magnet. A few minutes of use is enough to make the device start looking icky and grimy. It’s awfully thick too which looks out of place amongst today’s handsets which are becoming thinner and thinner with each passing day. Where the Z2 Plus excels in is in hand feel. The smartphone is incredibly compact for a device with a 5-inch display and fits very well in the hand. It’s great to see a more compact smartphone in a world full of giant monstrosities. This smartphone is great for people who are sick of the phablet offerings in the market and want a smaller smartphone without sacrificing on the specifications. 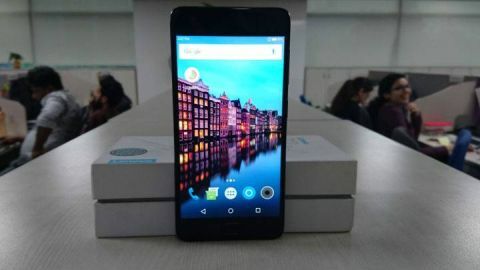 In fact, during the Z2 Plus’s launch event, Lenovo claimed that the 5-inch screen size was a deliberate move in this day and age of 5.7-6 inch screen in order to maximise one handed usability. Lenovo has also added some software tweaks which further enhance one hand use, which we will talk about later. This is for those who don't want their smartphones to stand out from the crowd and prefer minimalist designs. The smartphone has 5-inch fullHD display with a pixel density of 441ppi and a viewing angle of 178 degrees. It is protected by Corning Gorilla Glass. As mentioned before, Lenovo claimed during the launch event that the 5-inch screen size was a deliberate move in this day and age of 5.7-6 inch screens in order to maximise one handed usability. On pure specifications terms, the Z2 Plus is on a back-foot as the display is 'only' a 1080p full HD panel in a day and age where Android smartphone are moving to Quad HD resolutions. But frankly, a 2K display on a smartphone is necessary and pure hyperbole unless you plan on using t for extensive VR use. Many smartphone manufacturers like Sony and OnePlus continue to pack 1080p displays in their flagship smartphones as it provides the perfect compromise between battery life and usability. The display is sharp and vibrant, although the color reproduction is a bit on the cold side. The viewing angles are great and sunlight legibility is also at par for the course. All in all, the display on the Z2 Plus is in line with the competition and will not leave you wanting. The Z2 plus comes with the Qualcomm Snapdragon 820 SoC which has 4 custom Kyro cores — two high power cores and 2 energy efficient cores for less intensive tasks. The Z2 Plus comes in two variants, one with 4GB of RAM and one with 3GB of RAM. Both units feature DDR4 RAM, which Lenovo claims is 2.61x faster than DDR3. On the graphics side, the smartphone features the Adreno 530 GPU, which offers 40% improved graphic performance than the Adreno 510 GPU and is more power efficient as well. For the price, there is hardly a better buy than the Z2 Plus when it comes to performance alone. The handset screams through day to day tasks like browsing the web, using social media apps, taking the occasional picture and so on. Overheating is a slight issue, but not as much as to cause too much concern. The software is (surprisingly) optimised well and even offers nifty features that enhance one handed use. Gaming is also a delight on the Z2 Plus. Casual games like Subway surfers as well as intensive titles like Black Ops run very smoothly, without any dropped frames. To sum up, the Z2 Plus offers not only top of the line hardware but also well optimised software, something which is not often seen in Android smartphones. The Z2 Plus comes in two variants, one with 32GB of internal storage and a higher-end variant with 64GB of internal storage. What is special about the smartphone is that it features Sandisk's i7232 NAND flash storage chip which comes with a SmartSLC architecture that allows for much faster data transfer in situations such as continuous 4K capture. All such extraneous claims aside, the biggest disappointment with the Z2 Plus is the fact that it does not come with any way to expand your internal storage. The 32GB storage on the cheaper model will get full pretty fast, especially if you load up on a lot of movies and music. The Lenovo Z2 Plus supports 4G LTE, VoLTE, 3G, GPRS-EDGE/ GPS/A-GPS, dualSIM and comes with USB Type-C for charging and data transfer. The smartphone features a 13MP rear camera with a sensor size of 1.44 microns. Lenovo stressed during the event how they were not going for a higher megapixel camera but incorporated a larger sensor for better image reproduction. The rear camera also comes with PDAF and Electronic Image stabilisation. It can also shoot 4K videos, 1080p timelapse and 120fps Slowmotion videos. On the front, there's an 8MP camera with a sensor size of 1.4 microns. All this may sound good on paper but in reality the camera disappoints. Smartphones like the ZenFone 3 and the LeMax 2 offer better cameras at almost the same price point. Image quality in daylight and well lit situations is not bad per se, with vibrant colors and good amount of detail. However, in low light the camera really struggles, with a lot of noise creeping in and a considerable loss of detail. Sharpness is a big issue with a lot of jagged edges and pixelation in any complex shots such as dense foliage. On the bright side, the camera is quick to focus and take photos and the camera app has a neat and intuitive layout with all menu options presented in a circular format. As mentioned above, the Z2 Plus is capable of shooting 4K as well as fullHD 1080p videos. However the video quality is nothing to write home about. The stabilisation is rather poor and a lot of artefacts come into the video in less than ideal lighting situations. Another negative is the fact that there are not any serious manual controls to speak of and to fine tune your image you will need to download an external application. The front camera is fine for causal selfies intended for social media but don't expect to be taking stellar v-logs with it. The device runs on a nearly stock version of Android 6.0.1 Marshmallow out of the box. In the day and age of heavily skinned Android iterations, it is great to see Lenovo give us a largely untouched Android experience. Lenovo has also made other software tweaks in order to enhance one handed usability such as the redesigned quick switch panel which can be accessed by swiping up from the bottom of the display instead of swiping down from the top. It has 17 shortcuts which are all user programmable. A fingerprint sensor is integrated into the home button of the device.The company claims the fingerprint sensor is incredibly fast as well as self learning. The home button can not only unlock your device using the fingerprint sensor, it can actually perform 7 different functions. A single press takes you back to the home-screen, a long touch opens the notification centre, a double press brings up the app switcher, swiping left/right cycles between recent apps, a single touch acts as a back button and a long press invokes Google Now. This multi function home button is dubbed by Lenovo as U-Touch 2.0. Lenovo claims that the Z2 Plus can replace your fitness tracker. And to back that claim, the device comes with a sensor processing unit that tracks your steps, calories, distance and so on 24/7, much like Apple's M9 processor in the iPhone 6S. This is all paired with the U-Health application which displays all your activity stats and information on your smartphone. It comes with a high density 3500mAh battery with Intelligent Charge Cut-off that helps enhance the life of the battery. The Battery life is above average, lasting me the whole day with moderate to intense use. With a slightly lighter workload such as taking a few images and the occasional social media use, the handset can easily last you more than a day. PC Mark for Android gives the Z2 Plus a score of around 10 hours which is quite impressive making the battery life one of the positive aspects of the device. The Lenovo Z2 Plus comes in two variants, one with 3GB of RAM and 32GB of internal storage for Rs 17,999 and a higher-end variant with 4GB of RAM and 64GB internal storage for a slightly more expensive Rs 19,999. The Z2 Plus is a very interesting proposition from Lenovo. It offers great performance in a compact body which is great for one handed use. It is a breath of fresh air amongst the huge monstrosities in the Android world these days and even has software tweaks that enhance one handed usability. The design is both a positive and a con. On one hand, the design is sleek and minimalist and will appeal to those who don't want their devices to stand out. On the other, it is extremely safe and uninspiring, without much flair. What really lets the smartphone down is the camera. The Xiaomi Mi 5 and the ZenFone 3 offer a much better imaging experience at just a slightly higher cost. Overall, Lenovo has surprised me with the Z2 Plus, especially with its focus on one-handed use in a day and age where companies are moving more and more towards phablets.